I've contacted the Evernote team about an issue I have printing italic text. While they test and prioritize, they recommended that I follow-up here. I've seen this issue reported in 2012, and references to the problem even 2 years before that. Hopefully one of you have a work-around or know the cause? It's a simple problem. When text is in italics, it does not print correctly. From the desktop version of Evernote, each character seems to be in a white box so that the edges are cut off. From the web version, the text comes out normal (not italic). This happens when I print to various printers, use various computers, print to PDF, and even just print preview. I've attached a few files so everyone can see what I mean. Please respond if you are also having this problem, or if you know of a cause or solution! Thanks! Hi. It may or may not be practical depending on how much text we're talking about here, but the work-around to various printing issues is pretty much always "use a word processor and attach the file to your note." The WP software will open the note for editing directly from the note, and will save it back there on completion. You can also then use the WP printing controls which are considerably more flexible than EN's built in options. In this case you could copy/ paste your note content into the WP file and tidy up any formatting issues there, and then retry printing. If you have the facility to 'print' to PDF file, you may also be able to print your note content to PDF and use a PDF reader or Adobe Acrobat to open an print that file to your printer. Edit: Sorry; missed the last bit of your post until now..
@gazumped, that's true and thanks for the advice. My goal was to have a single application that I could use to store notes and share them (sometimes printed) with others. I don't have complex formatting needs, but I do need the simple ones. I've grown to accept that the tables won't work perfectly, and that there's no way to have ordered lists with unordered lists nested in them. I don't need handwriting recognition, PDF annotation, or even spell-check. But italics is pretty basic! It's possible I'm just using the wrong tool, and should move to a wiki-based tool instead. That would still allow for storage and sharing, linking and tagging, but would also give me some of the basic presentation tools like font styles. Any updates to this issue. I've had this problem for years now. "My apologies if it was not clear to you in the first email, but the issue that you're reporting is being worked on by our product team. Until they fix it and include it in an upcoming update we will have to be patient and wait." "The workaround might be to change the italicized fonts to plain or maybe bolded until we have resolved the issue." I'm fairly discouraged that a problem like this would be reported in 2010, continuously reported through the years, and remain an issue in 2016. This is true of many Evernote bugs/glitches, sadly, not just printing of italics. First, assume that Evernote's printing is broken and will be forever because it is is too low a priority to ever be fixed. AFAIK Evernote employees no longer respond to threads about printing. Evernote's printing is just Everbroken. Second, copy/paste whatever you need to print into Google Docs, MS Word, or Libre Office or something to that effect. Print from there. Third, if you find yourself needing to print a lot, then it may be better to migrate from Evernote to OneNote or Apple Notes or even just MS Word stuff stored in files and folders. Same problem for me. Among many other uses for Evernote, I use it for Journaling. So I've got hundreds of notes, many with italic text. And now I'm beginning to use it for all my genealogy research as well. The solution I found online to printing/storing/saving/sharing my Journal notes (outside of Evernote) was to Copy all to a new/temp note > Merge into one > then Print to PDF. Looking at the resulting PDF, all the italic text appears just as you describe; clipped. So just over a year ago I said..
@FuzzyDoug, in my last contact with the Evernote support team (on Nov. 2016, which was a follow-up on my bug report of Feb. 2016), they said that a fix was coming soon. I'm using the most-recent Windows desktop version, and it is still broken for me as of today. I sent another follow-up email, though, and I'll share any info I get from them. @FuzzyDoug I heard back from the Evernote team with an update. They said italics don't work because the Evernote system uses an older version of Chromium Embedded Framework (CEF). The problem is actually in that framework, and so they are changing over to a newer version of the framework (CEF3). It's taking them a long time to change over to the newer version, so they don't have an estimated timeframe for when we'll see it working, but when they finish moving to CEF3 we'll have italics. After getting that response from Evernote, I googled for issues about italics in CEF3. I found one person discussing an issue with italics in version 3, but that was in 2013, so hopefully they fixed it in patches and Evernote is using one of the patched versions. Keeping my fingers crossed on that. It's enough for me. Even if I already paid 4 months ago for Evernote, I will switch to OneNote. A simple task as resizing an image or highlighting text with a color different than yellow or in this case, printing italic text is really boring, not acceptable. I'm afraid of what I can find in the future when I will have too many notes. This is for me, 90$ dumped to the garbage. There's a simple work-around, a fix is in the pipeline, it is possible to resize pictures, and it seems a little premature to dump a paid-for app 'in case' there are more future issues - when the current ones are temporary at best. But hey - your choice. Bye. But hey - your choice. Bye. @gazumped, are you paid by Evernote in some capacity? Nope, not in any way, shape or form. I'm based in Wales, UK and do writing and photography and stuff. Why? @gazumped I ask because you sometimes come across as rather strident in your defense of this product. If you were a representative of the company, I was going to recommend that you let people engage in discourse without insisting that they are wrong at every turn. Using this thread as an example, I think it's completely reasonable for people to want to print from a note-taking software, use italics and other standard formatting features, etc., and I think it's completely reasonable for people to indicate their discouragement in seeing a commercial product not responding (by fix or even comments on this board) to bugs that have been reported by paying customers for 7 years... especially when the new framework has been available for years now. Evernote provides this forum to share ideas, and originally to provide a platform in which their staff and their customers could communicate (although that seems to have fallen by the wayside). There's nothing wrong with sharing the feedback that there are deal-breakers, things that will drive their customers to a competitor. Far from it, in fact -- Evernote should find it tremendously valuable. You're entitled to your opinions of course, but I wish you'd give others the same courtesy and not shut down conversation when you feel it is not sufficiently supportive of the product. OK - thanks for the explanation, and I'm sorry if I come across as 'strident' in some cases. In this thread though, as far as I can see I posted 3 times. #1 in response to your query, to try to be helpful with workaround suggestions - since the feature isn't currently working, and realistically you can't expect a software house to introduce changes overnight on request. I didn't say anything about Evernote being right or wrong, good or bad - just 'this is anotherway to do it'. Then a couple of people repeated the query and pretty much the same solution. #2 I re-sent my original post too. Then you helpfully posted your updates from Evernote, one of the recent posters was happy, and someone else leaned in, had a winge and left. #3 I pointed out that most of the comments made were probably incorrect (which wasn't strictly necessary, but hey)..
@gazumped you're right. When I saw your response to @Samyboy I conflated it with a similar set of responses on another thread (also about italics, and also with comments that people will leave over this bug) and mistakenly thought you were the same person as in the other thread. But that person was @jefito who scolded us that we should not talk like that (about importing and exporting to and from other note-taking applications) on these boards. LOL oh... we don't talk about @jefito..
Jeff is fully capable of posting his own comment here if he wants, but in general I'd expect that he was only pointing out that while we're all users here, and Evernote staff don't usually comment on individual posts, any active discussion of competitor products here is impolite to say the least, in space that Evernote are paying for. I'm happy if I'm off the hook (for the moment) anyway - but seriously; if you ever get unhappy with anything anyone says, or the way that they say it around here, use the 'report' button that's on every post, or call 'em out like you did with me. No hard feelings - an occasional reality check never hurt anyone! As best I can tell, my comment there was a reminder to keep on topic, rather than turning it into a how-to-move-to-onenote/whatervernote discussion. In the spectrum of scolds, it was on the weak end, I think. And it's possible that I got it wrong. Regardless, I will note that while discussion of OneNote and other competitors is not forbidden here, too much in-depth discussion about how to move to a competitor seems to be kinda frowned upon by the actual powers that be here (actual Evernote employees, not unpaid volunteers like gaz and me). I don't know where the line is, but I think that it's best to remember that this is an Evernote forum, not a OneNote forum. This issue is scheduled to be fixed with the 6.8 release. Thanks for your patience. I'll post any updates I have here. Currently we are on 6.6. Am I right in supposing that 6.8 will not be available before the end of 2017 at the earliest? No ETA at the moment. Once 6.7 beta 1 is out, we'll have a better idea of when 6.8 will come. I'll be sure to keep this thread updated. This is now fixed in 6.8 beta 2. Please let us know if you experience this issue after updating to the 6.8 beta 2 or the 6.8 GA. Thanks. Print preview is being faked by automatically creating a PDF to display. Printing from File has a different output than printing from Print Preview as far as kerning, character height and word spacing, even boldness of italicized characters. But, both ways do not cut off italicized characters, put the underline through the words, and allows highlighted text. Knowing this is Beta and not public release, we're cool. As a paying subscriber, I feel I would be remiss if I did not mention that because Evernote PRIMARILY is a note taking app, the fact it took 7 years to prioritize properly displaying and printing the notes created within Evernote apps seems to be a bit negligent and amiss from the spirit of the thing. Notes are the thing. Focus on doing the thing well, then bring other things aboard, but don't neglect the thing. It's still not really fixed (based on the non-beta download I got today). If there is punctuation after italic words, the punctuation marks get lost because they aren't kerned correctly. If a note is open in the Desktop version and you click File > Print Preview, you get the Save As window (to save as .pdf instead of previewing). Interestingly, some italics look correct online while others are still clipped. I mostly wanted italics for school notes -- I was keeping all my notes and their citations in Evernote. Every citation uses italics for book or journal names, so not having italics was a serious problem... and I have about 5,000 notes... so this was a really important and urgent for me. But I stopped being a paying customer, I've been slowly migrating notes out as I needed to see their formatting, and I've almost finished my degree. It's a shame because the hundreds of thousands of people taking university-level courses all need a way to manage their notes and citations and Evernote would be a perfect solution if it weren't for this one critical problem. It seems to me that Evernote is leaving a lot of money on the table by not providing something so simple that would really mop up all those student dollars, but I'm sure there's a business reason for their decisions. @JohnLongney, I installed 6.8 (Windows Desktop non-beta version) today. I don't know how long it's been available, but it's available now. I didn't find that it fixed the italics issue entirely; I left a comment at the end of this thread with my findings and thoughts if you'd like to take a look before installing. @Austin G I am still experiencing issues with italics after picking up the non-beta release today for the Windows Desktop version. I've left my thoughts and findings at the end of this thread if you are interested in taking a look. hello and thanks for the reminder. The printing issue seems fixed as long as you stay with standard type of fonts. Basically I spend more time with Photoshop and tend to select fancier fonts which would be somewhat overdone for normal writing. however I was amazed to discover how different Segoe UI looks and prints from Photoshop vs Evernote and OneNote. I am certainly no font expert but as I understand printers may, or may not, print as shown on the screen. The latter certainly applies with some fonts going for free. What I find grotesque with Evernote is that print preview emulates conversion to pdf format. What is that for? @JohnLongney I'm using the oh-so-exotic Tahoma font on a Windows computer. Which font did you find works correctly and consistently? And would you happen to know if there's an easy way to change fonts throughout all notes? Evernote, being such an advanced editor has a font manager which spills the beans. Call it up (in the German edition under Format) and you'll see which font will display and print , aka WYSWYG. In my case the basically meagre choice within Evernote is narrowed down to few that will produce correct results in italics. Tahoma, regrettably not. In other words, however popular or even installed as standard Windows font, there is no guarantee of full support. It all boils down to the standard recommendation, if the app does not suit your particular wish, use another one. Evernote decides what goes. Arial is supported, hence my standard in Evernote. Sad, isn't? I'm not able to see any issues with printing italic Tahoma font using Evernote for Windows Desktop 6.8+. Can you reply with a screenshot of what you're seeing, or share a public link to an issue note? And would you happen to know if there's an easy way to change fonts throughout all notes? Adjusting the font from Tools > Options > Note will apply it to all notes. Select File > Exit, and reopen the app after the change to save it. @Austin GSure, here are three screenshots. I'm using Evernote Desktop for Windows, version 6.8.7.6387 (306387). The picture with the word "Journal" circled is viewing a note on my screen. The font is Tahoma, 10 point. The word Journal is followed by a comma which is also italicized. As you can see, the letter L is clipped. The picture with the word "phrase" circled is from a note that was printed to PDF and is identical to printing to paper on a standard HP printer. It is also Tahoma, 10 point font, and again here the comma after the word is italicized. After the comma is a space and then the word "and" -- as you can see, the space is clipped to the point that the comma even touches the letter A in the next word. The third picture shows the same sentence in 8 different fonts. Tahoma (a sans serif font) and Century (a serif font) are both clipped. The others are either not clipped or the font has enough space set around the comma to make clipping not noticeable. This was printed to PDF. All sentences are in 10 point font with the comma italicized. @Austin GSure, here are two screenshots. I'm using Evernote Desktop for Windows, version 6.8.7.6387 (306387). Thanks. This appears to only occur when the italic formatting in the text line ends, and is followed by regular text. I see this on my end too and have reported it to the development team. Let me know if you find any other examples. Thanks again. I just updated my post to show the issue in various fonts. My post should now show 3 screenshots. Great! Thanks for providing this. Very helpful. I will update here once I can confirm when a fix is scheduled. This appears to only occur when the italic formatting in the text line ends, and is followed by regular text. I see this on my end too and have reported it to the development team. Let me know if you find any other examples. Thanks again. I just want to ask that you also report to the development team a major DUH! Really? They didn't test it with a return to regular text in the same line? From the third screenshot, it looks like it's not happening with all fonts. I'm sure we did, but not with all the font combinations.... There's always room for improvement! From the third screenshot, it looks like it's not happening with all fonts.I 'm sure we did, but not with all the font combinations.... There's always room for improvement! My question is why allow font styles which Evernote does not fully support? The classic case of Tahoma shows the problem. Standard and bold is supported, but italics gets replaced by something similar. Either a warning pops up as one is about to format in an unsupported style or simply block alteration. 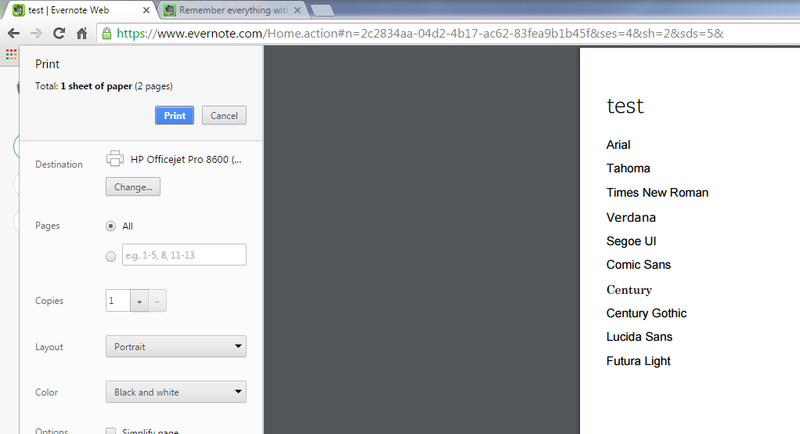 Evernote need not support a vast range of fonts but the current sitation is really bad. The lack of quality support in the form of a user manual shows itself time and again. So are you saying block all use of italics if there's at least one typeface that doesn't work perfectly? Really? The classic case of Tahoma shows the problem. Standard and bold is supported, but italics gets replaced by something similar. According to Wikipedia (see https://en.wikipedia.org/wiki/List_of_typefaces_included_with_Microsoft_Windows) and my current Windows 10 installation, Tahoma is only shipped with regular and bold styles; italics needs to be synthesized by the font engine (i.e., they skew the characters mathematically), which is probably why you're getting imperfect italics there. That fact, though, makes it not a such a great idea to use Tahoma as a default, if that's what Evernote is doing (I can't remember, it's been awhile; it's my current default, though). Either a warning pops up as one is about to format in an unsupported style or simply block alteration. ??? Oh well, I'd guess that that approach would just make for more of a UX and support nightmare. Imagine the forum flame rants if that behavior was implemented. Look, this situation is unfortunate, but my guess is that they're somewhat at the mercy of their common editor. It might be hard (if not impossible) to get at the finer control that you can achieve when using the native Windows GDI (or whatever API they'd use otherwise; it's been awhile since I was in the world of Windows font handling) so as to achieve the results you might see in a more mature product like MS Word. But I don't think that throwing out the italics baby with the bathwater makes much sense either. @jefitoI think that's unfair. What I'm sure is meant is this: Please sell working software; do not spend almost a decade figuring out fonts and then roll out something that is broken. That's not an unreasonable suggestion. I appreciate that you love Evernote. I wish I had as good of an experience. A really strident defense of Evernote's mistakes just makes them look worse to unhappy customers, though, because we are trying to come together to share input, ideas, what works, and what doesn't, so that we can have the best possible experience. We're invested -- we're here. Coming in strong to shut down anything except compliments is not so great from a customer perspective. Maybe something to consider, depending on your ultimate goals here on these forums. 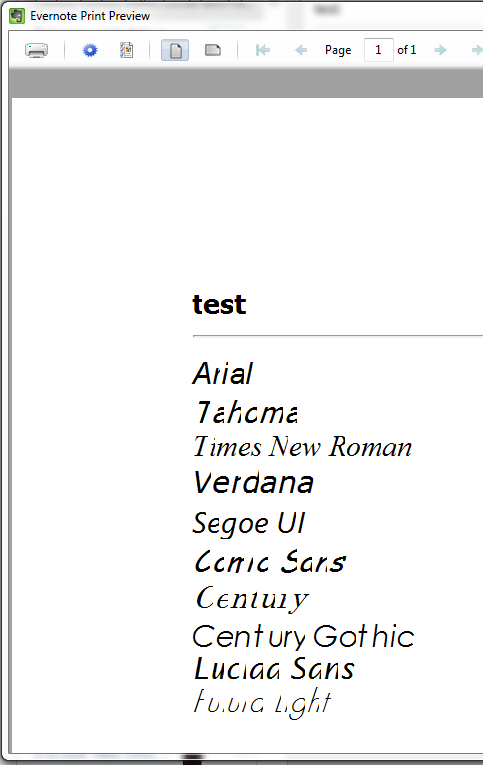 not even half of the fonts I have on my system come up in Evernote and I do not mind. It is utterly annoying however if fonts as ordinary as Tahoma produce such miserable results when in italics. Why can Evernote not pop up a warning note against unsupported style wherever applicable? I am not even suggesting the obvious solution. But one thing I'd like to make clear to you and that is: no software company is at the mercy of software code chosen a decade ago. Your attitude, shared by a few other omnipresent ever-defending users will encourage Evernote to carry on at snail-pace to catch up with current editor standards. Good luck. First, the examples you've posted exhibiting the problem here are great. The software dev in me lives for stuff like that when bugs are reported, and I'm sure that the Evernote folks appreciate it too. I think it was actually a pretty fair characterization of what he implied. How would the software solution to "My question is why allow font styles which Evernote does not fully support?" be implemented? My educated guess is that they're not going to just turn off italics for typefaces where they don't work properly, even if they could discover them at runtime. And they're not going to filter such typefaces out of the list. But JohnLongney can go ahead and clarify what he meant, since I did actually ask for that..
Anyways, in my experience, the term "working" is a spectrum. Evernote is working fine for me in most cases, and I think for many other people. Italics being weird doesn't bother my use case (I have other complaints, aired elsewhere); your mileage appears to vary, and that's unfortunate. But nobody is suggesting that Evernote can't be improved, or that people shouldn't ask for improvements, etc..